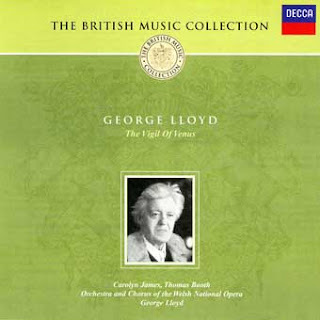 The five “middle period” symphonies of George Lloyd, Nos. 4-8, constitute the most impressive body of work in the medium by any 20th-century English composer. 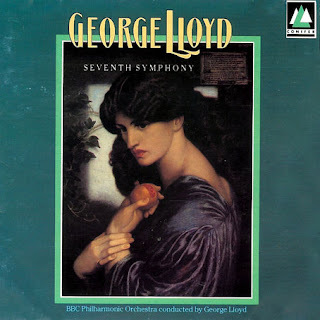 Among symphonists, Lloyd’s emotional range surpasses that of Bax, while his orchestral brilliance surpasses Vaughan Williams, perhaps his only serious rival. Each of these works is quite different, while recognizably being the work of Lloyd and no one else. His reputation as a “conservative” is exaggerated. Lloyd was a melodist, and any composer whose work relies on creating expressive tunes will necessarily also rely on tonality. In all other respects–harmony, orchestration, and rhythm–Lloyd was as modern as any of his colleagues, however more “avant-garde” they may have sounded. For example, one of the most characteristic sonic realms that Lloyd explores, in the first movement of this symphony and elsewhere (the scherzo of the Fourth and Fifth, much of the Sixth), is that of a bright, breezy lightness of texture, rhythm, and movement. Among modern composers, only Elliott Carter has done similarly, and of course he and Lloyd in all other respects sound so different as to seemingly come from different planets. But this is without a doubt one aspect of Lloyd’s modernity. Another is his use of mallet percussion, glockenspiel and xylophone, as the coloristic glue that binds the work’s outer movements together.